Unlike traditional audio ads – such as those used by podcasters – these brief ads were designed to be interactive. VoiceLabs had begun testing its system at the beginning of the year, then launched it publicly in May, 2017. The idea was to give Alexa developers the ability to make money from their work, by aggregating their Skills together as a nascent ad network of sorts. This group of apps was sold en masse to brands who wanted to reach consumers in their homes – through Amazon’s connected speakers, like the Echo, and other Alexa-powered devices. At launch, advertisers including ESPN, Wendy’s and Progressive Insurance were participating. Other partners included Federated Media, XAPPmedia, TWiT.tv, Appbly and various independent Alexa Skill developers. However, even as VoiceLabs was making its public debut, Amazon was starting to crack down on advertising within Alexa Skills. 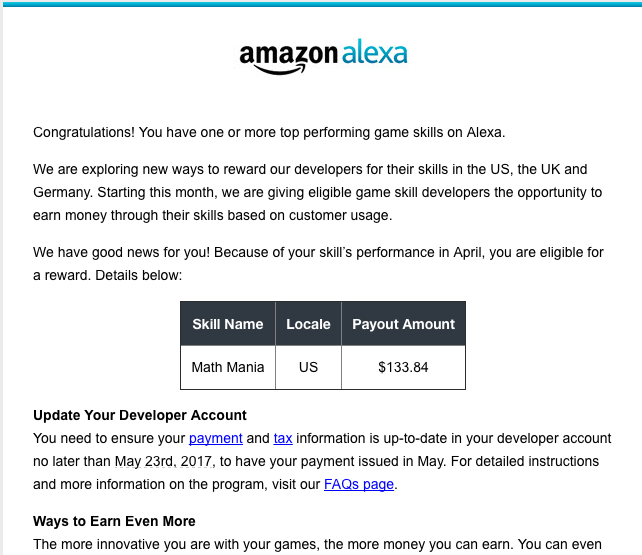 In April, Amazon quietly updated its Alexa Skills Developer agreement to further restrict ads used in Skills. Before, it had banned apps that used the Alexa app home cards for ads – cards that popped up in the Alexa app to describe the Skill in question or further enhance it with text-based content. The only exception it carved out to this new rule was for streaming music, radio and flash briefing Skills (news briefings) where advertisements were not the core functionality. Because of this loophole, VoiceLabs believed it was okay. At the time, the company told TechCrunch that many of its then 1,300 developers using its platform were planning to use Sponsored Messages in flash briefing Skills. But later in May, Amazon further refined its “no ads” policy to state that ads couldn’t use an Alexa-like voice, imitate Alexa interactions, and couldn’t include either more or different advertising than what was used outside of Alexa, among other things. Or, more simply put, Amazon cracked down on interactive ads. It didn’t want brands to converse with customers through their ads, apparently. In a blog post announcing the shutdown of the Sponsored Messaged program, VoiceLabs CEO Adam Marchick acknowledges the problem this change created. As an example, he referenced an interactive voice ad that asked an Alexa user if they were planning to watch the NBA finals game that day. If the user said yes, it would tell the to tune in for the 6 PM start time. If they said no, it told them they could tune in at 10 PM to catch the highlights instead. “This ability to react to user preferences opens the door to a whole new field of audio advertising, and the May 21st Policy prevents this,” Marchick continued. “We understand why Amazon did this, and based on this policy change combined with the limited set of Alexa skills that are allowed to advertise, we made the decision that the market was not ready. VoiceLabs is and always will be 100% within Amazon policy,” he added. However, while the VoiceLabs ad network is shutting down, the company is not. “We have a ton of unique insight from working on Sponsored Messages the past six months, that will benefit us and the rest of the market,” Marchick tells TechCrunch. He says VoiceLabs will now focus on its Analytics product instead – one of the only ones to operate in this space, in fact. That said, developers who were poised to make their first money from their Skills are not happy with Amazon’s policy changes. One developer, Nick Schwab, wrote a complaint to Amazon about the matter, calling Amazon’s policies “restrictive” and not developer-friendly. “I’ve invested hundreds of hours into building, maintaining, and offering support for my Alexa Skills, and the Sponsored Messages platform was finally going to give me a way to get rewarded for my investments – to the extent that I probably could’ve quit my full-time job if I wanted to,” Schwab told Amazon. “Amazon’s policies have shuttered the doors to a platform that was welcomed by developers and rarely complained about by consumers, leaving me once again with no way to effectively monetize my Skills…,” he said. It’s true that there are only a few ways for developers to make money from Skills today. Last month, Amazon began paying developers of Game Skills directly, to seed the market with this popular Skill category. Developers say they can also use a freemium or paywall model via account linking, but trying to convert Skill users to a paid, full version of a Skill often doesn’t work out, or, worse causes users to leave 1-star reviews. Amazon’s inattention to developer needs could ultimately be an Achilles heel for the company. Amazon, however, believes its policy changes that ended VoiceLabs’ ad network were necessary to preserve a good consumer experience for Alexa users.